Thus far my experience with Canada has been in small towns out in the middle of vast expanses of undeveloped land. Based on that, Canadians seem to be friendly, helpful, courteous, and honest. Whitehorse, Yukon presents itself as a big city, with its large downtown buildings, big box stores like Staples, Wal-Mart, and all the fast-food chains that permeate the Great North. Because it's the capitol city of Yukon, it grew this way. But it only has about 25,000 people. So, you get all the amenities of a metropolis, but without all the traffic, the noise, and the cops. The Yukon HOG chapter is based in Whitehorse, and they seem have an influential presence here. 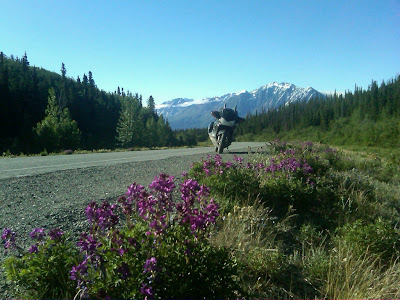 They created this "Motorcycle Friendly" campaign all over the Yukon. 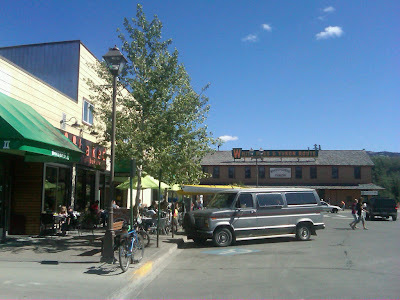 Whitehorse, Yukon, a busy sidewalk cafe amidst the railroad depot. Basically, they went to every gas station, restaurant, bar, and hotel in the territory and asked them to sign for up their "Motorcycle Friendly" policy. Signing up was as simple as coughing up some cash and paying it to HOG. 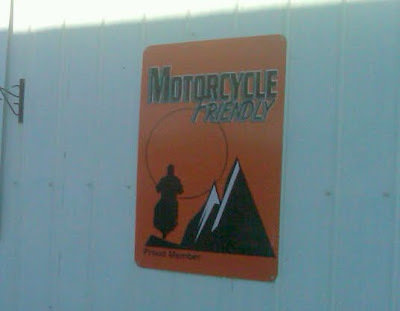 In exchange, the business gets an orange placard saying "Motorcycle Friendly - Proud Member" to hang on their wall. Then when the Yukon HOG does their annual rally, riders are encouraged to patronize only these businesses. I chatted with the owner of a FasGas service station about it. "Actually, I don't really care if someone rides a motorcycle or not, it's all the same money to me", he said. "But it brings in a lot business during the rally". It turns out lots of businesses have these placards on their buildings. If you want the best eats in Whitehorse, go to Klondike Rib & Salmon Barbecue on the corner of 2nd Ave and Steele St. I had their "Wild Muskox Stroganoff". I mean, where else are you going to get Muskox? Wow was it good! Very tender chunks of muskox in a wine-based gravy with mushrooms over wild rice. 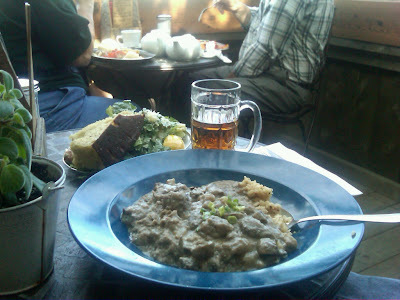 They also have Elk Stroganoff too, and Caribou Stew. All their beef comes from Alberta-grown cattle. But the Klondike Rib & Salmon Barbecue accepts only Canada-based credit-cards, or cash. I asked if they accepted US currency and they said "yes". I was saved! In fact, thus far I found that most businesses in Yukon and the rural parts of British Columbia accept only Visa or MasterCard as credit cards. Some places will accept American Express, and very few accept Discover. I talked to a gas station owner in Haines Junction, YT about the Discover card, because I had seen a Discover card symbol on his store window. "I actually stopped taking it about a few months ago", he said. "Their membership fee is very expensive, and they wanted me to do 10,000 swipes a month to waive the fee. I only do about 170." It seems that's the problem with Discover Card, and probably American Express, in Canada. I actually did not exchange any currency into Canadian. Well, scratch that. Actually back in Hyder, AK I had to exchange some dollars into Looneys (Canadian $1 coins) because the showers in their campground accepted only Looneys. Otherwise, converting US dollars in to Canadian is probably not necessary, as it seems most businesses here accept US, and the exchange rates right now are almost one-to-one. But if you do exchange any currency, then get Looneys. The parking meters take them, the campground showers require them, the motel washing machines require them, and most Canadians seem to transact heavily with coins. Free Wi-Fi seems to be difficult to come by in Whitehorse. When I first pulled into town, I spotted a restaurant called "Kathy's Restaurant" on the corner of Main St and 4th. It had a sign that said "High Speed Internet". I parked my bike and brought my netbook inside. The place seems to be run by fiery old lady with extreme bucked teeth and thick glasses. I verified with her that she had Wi-Fi. "Nope!" she said abruptly, and then continued on in a tone of voice like Granny on The Beverly Hillbillies. "That's the hotel next to me. I don't have Internet!" 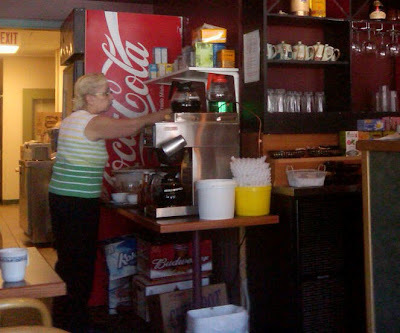 She said free Internet used to be in just about every restaurant, bar, hotel, and coffee shop in Whitehorse. And then people started abusing it. "They'd be online for 8 to 10 hours at a time." she said. "I'd have hotel people next door come into my restaurant and order coffee, and sit here the entire day and not buy anything else!" Then she put a fist on her hip, and the other hand pointed a finger at me, and she said, "My policy if you want to use hotel Internet in my restaurant you have to buy something once every two hours, or else I kick you out!" I didn't bother opening up my netbook. She was probably the only Canadian I've met thus far with an attitude. As for the ride today, it was lovely. Beautiful skies today. 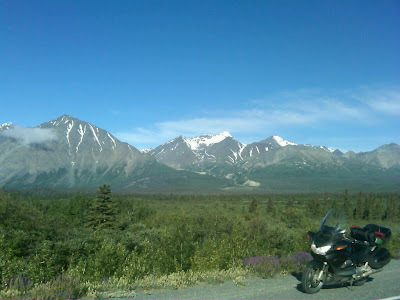 It seems the rain storm yesterday cleaned up the air and offered me crystal clear views of the St. Elias Mountains. I mean, if you recall from yesterday, I said I killed my cell phone in the rain and was down to just my BlackBerry for taking photos. 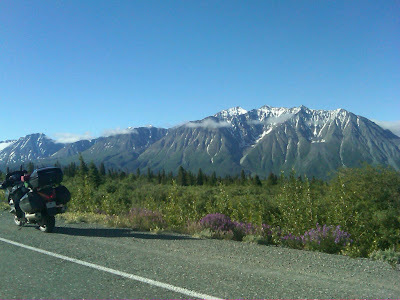 And to do that, I'd have to stop the motorcycle, unplug my heated gear, take off the glove, and then take the BlackBerry out to snap a photo. So, I just didn't feel like taking many photos today. Except, I saw some scenery that was just too gorgeous to pass up. You have to see this stuff in person, in real life, to have your breath taken away. My photos are doing this landscape a gross injustice. 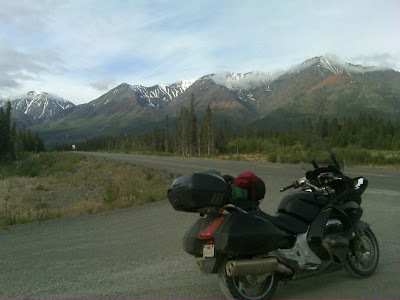 But otherwise, it was a short ride today, of about 180 miles from Congdon Creek Campground to Whitehorse. I wanted to spend some time in Whitehorse and really get a feel for this place. Who knows if I'll ever be back here again. Yukon HOG appears to be running an interesting cough-cough-racketeering-cough-cough... program there. One has to admire their system of securing protection money... er.. I mean, "donations." wow........quite a trip Steve.......I hope to make the same journey in a few years........God willing and the creek don't rise. I'll keep reading and you keep safe.